The Grant County EDC May Board Meeting will be held at BBCC ATEC at 7AM on May 15, 2019. The Grant County EDC April Board Meeting will be held at BBCC ATEC at 7AM on March 17, 2019. The Grant County EDC March Board Meeting will be held at BBCC ATEC at 7AM on March 20, 2019. The Grant County EDC February Board Meeting will be held at BBCC ATEC at 7:15 AM on February 20, 2019. The Grant County EDC 2019 Annual InvestorMeeting will be held at BBCC ATEC at 7 AM on February 20, 2018. 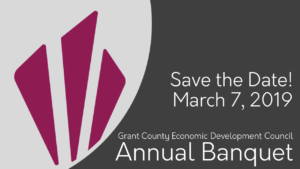 Save the Date for the Grant County EDC’s 2019 Annual Banquet! The Grant County EDC January Board Meeting will be held at BBCC ATEC at 7AM on January 16, 2019. In observation of New Years, the Grant County EDC office will be closed. In observation of Christmas, the Grant County EDC office will be closed. The Grant County EDC December Board Meeting will be held at BBCC ATEC at 7AM on December 19, 2018.